All classes are held at New Westminster Secondary School and run twice a week from February 4 to June 17. Courses offered through our New Westminster Schools Adult Learning Centre program include: Biology 12, Chemistry 11 and 12, English 12, Pre-Calculus 11 and 12, Physics 11 and 12, and Foundations of Math 11. 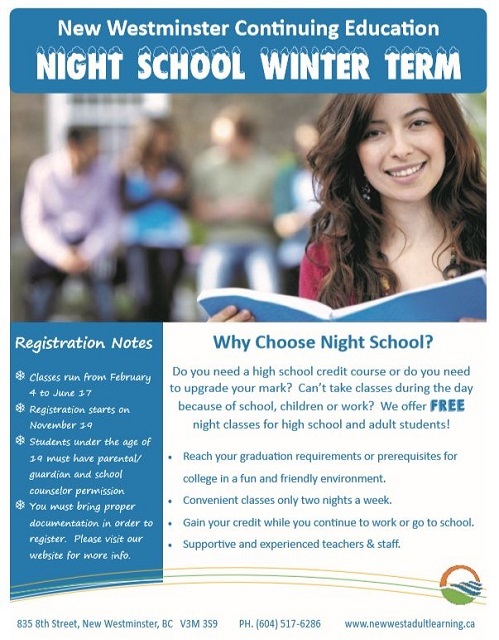 For more about courses, schedules and registration information, please see our flyer and visit our Academic Night School website here.